"There are many jobs on the farm, so the farmers divide up the work. One farmer raises chickens and collects eggs. Another farmer grows salad greens. Others tend the fruits and vegetables, or milk the goats and make cheese. Everyone takes a turn selling the food at the farmer's market." We are hearing more and more about the benefits of buying local, of eating more fruits and vegetables, and of providing support for the people who live and work in our communities. The emphasis for this new nonfiction book is on farming practices that benefit the environment, on maintaining the land so that it can continue providing for our needs and on encouraging a lasting love for nature. The small farm described here gets its life from a group of dedicated farmers who make up the Glen Valley Organic Farm Cooperative in Abbotsford, British Columbia. "Almost everything we eat begins as a plant that grows in the soil, or as an animal that eats the plants that grow in the soil. Fruits, vegetables, wheat, milk, eggs and meat all come from the land. When farmers take care of the land, they are also taking care of our food." She describes the many tasks that must be undertaken in spring to ensure that the food needed will be there when it comes time for harvest. These foods will be used by humans and animals to keep them healthy and strong. Each season brings more work. The jobs are described and green fact boxes add to the information shared. We learn that healthy foods make for a healthier family, that farmers have an important role to play in the life of a community and that we all must work to assure a bright and healthy future. 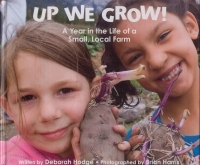 Children who read this book will see the connections between the food that they eat and the places that supply it. 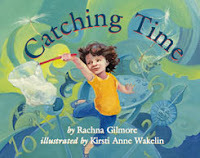 It is a great nonfiction readaloud for early years classrooms, and will encourage much discussion. If you are planning a field trip to a nearby farm, it would be a perfect introduction to some of the work that children might see happening during their visit. The photos are clear and very informative. Children get a distinct picture of the daily routines on a working farm. They also exhibit the joy that the workers feel in oprerating a farm that will serve so many. It is hopeful in tone, and encourages children to learn as much as they can about their role in maintaining the land, and loving nature. In the end, we will all benefit from that! ROAR! NOTHING CAN STOP ME!" You can bet I will be adding this to my 'if you want your child to be a reader, get this book' list! It's important for children to love 'stories' from their first attempts at trying to master text. If the book doesn't make sense, or sound like a book, what's the point? Of course, they need help with sounds and symbols. But, first and foremost, they must want to do what you do when you read them great books that spark their interest and give them context for telling their own stories. They need phrases that repeat, words that they have in their own internal catalogue, and they need the characters in their books to be doing what they do. The text should be simple and predictable with captivating and helpful illustrations adding to the appeal. And, humor helps....well, it certainly does in this fun book. Any child worth his or her salt is going to complain when they hear the dreaded 'b' word...bedtime! You'll need your most animated and your loudest voice to bring this cagey dinosaur to life! I guarantee you will read it over and over again...even though your young one will soon be reading right along with you. Nothing will stop this train wreck called Dinosaur! Leaves don't get in his way...he plows right through them and WINS! Big, tall slides mean nothing to him! A bowl of spaghetti cannot be big enough! Grown-ups don't faze him! Dinosaur wins every time. When the bath is taken and the teeth are brushed, Dinosuar comes face to face with his most frightening foe...bedtime. No amount of roaring suffices. A new winner is declared and Dinosaur won't battle back until the morning. Sure to charm from the first word, young readers will listen with delight as Dinosaur roars his way through his day in much the same way that they do...fearless, energetic, full of bravado, and endlessly exuberant. A worthy addition to a growing list...thanks be to writers whose goal is to get wondrous books into the hands of our youngest listeners! Did I just say you can smile when you eat BROCCOLI?!?! I wasn't sure I liked this book when I read it first; but, like all good things, the more time you spend with them the more appealing they become. I can't wait to read it to a classroom full of 'smiling' and happy kids and to watch their faces light up. What fun is that? 'Let an umbrella be your umbrella.'" Every page is funny, with Birdy firmly and constantly reminding us of the importance of our smiles...not only for ourselves, but for everyone we meet. She loves the idea that photographers often ask their subjects to 'say cheese'. If she had a chance to be a food, cheese is what she'd be! She loves smiling, and seeing its effect. She shows her audience what happens when one smile leads to another, and then another, and then another until it reaches all the way to Timbuktu. If she can send her smile so far away, maybe she could send one to the moon. But, that will take a lot of practice! A quick look to the right and there's a round plastic mirror for all those who share this delightful book to get right to it....start practicing! I like the illustrations which are done with mixed media, and warmth. 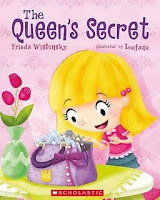 Birdy is a wide-eyed, welcoming young lady whose humorous side is evident throughout the fun-filled pages. The font changes in size and color will hold the attention of the intended audience and show young writers some interesting techniques that they might try to enhance their own stories. in case of a chill?" Does everyone wonder what the queen has in her purse? Kay has an innate curiosity about it. In every picture she has seen, the queen is delicately holding a purse. It conjures up a variety of images of Her Majesty as she goes about living her life and the needs that a purse might accomodate. In rhyming text she shares her questions with readers and assumes that said bag holds a legion of important items, useful at any time of day or night, in any circumstance and at any event. It is with great surprise that Kay chances to see the Queen, in a hat that matches her outfit and without her crown, on a visit to Kay's home town. Kay is awestruck and waits her turn to shake hands with her idol. As they share a moment, the purse takes a tumble and opens wide as it falls at Kay's feet. But pink and quite fat!" The queen would like it kept secret and Kay makes a solemn promise. Kay never forgets her promise and is rewarded with a special invitation to tea for two...and their teddy bears. I am always on the lookout for rhyming book for young readers. I love that this one encourages imagination and offers up ideas for future writing for its young audience. I continue to build a list of novels in verse, and am delighted to add this wonderful book to that growing list. It is fun to read, and filled with Sister Slam's (aka Laura Crapper) take on life and love. She is keen to reinvent herself on a summer trip to New York, where she and her friend Twig will compete in a poetry slam. Sister Slam and Twig are fully realized characters in this book of lively, heartfelt verse. She deals with the issues that many teens encounter...weight, love, loss, anger, independence. She and Twig like to write poetry and they are eager to share their writing within the encouraging 'slam' community. Off they go in her Mom's old car with youth and confidence on their side. I was in deep smit." Jake is concerned for their welfare, considerate, gorgeous, wealthy, and quite taken with Laura from the moment they meet. Winning the slam is not what happens, but they do get much recognition for their writing and begin performing around New York. Jake is their biggest fan, cheering them on and encouraging their dreams. His parents play a role in helping the girls find more exposure and also in welcoming them to their home, while honoring who they are. Jake is a musician, and he loves Laura. Life is good, until an emergency calls her home. She does what is right for her in the now, finding a summer job and living with her Dad. She and Jake stay in close touch, until Christmas looms and he suddenly stops communicating. She is filled with uncertainty, thinking that he has finally come to his senses and dropped her. In keeping with a sports theme for today, I want to tell you about a new book by Kevin Sylvester. Kevin is an illustrator, a broadcaster, and an author. He is also a researcher and in writing this book, he interviewed twenty people whose jobs take place behind the scenes and contribute enormously to our enjoyment of the sports we love. Were it not for them, we might not be so familiar with the athletes we admire. Each chapter gives us a glimpse at the life led by someone we are not likely to meet or know in any other circumstance. They are the unsung heroes. They are the groundskeepers, the camera operators, the mascots, and the reporters. They are agents to the players. They schedule games for leagues and timekeep official games. They choreograph skating programs that leave us in awe. They provide music, keep the ice clean, referee, train horses and keep athletes strong and healthy. Without them, athletes and fans would be less likely to spend our time together. "I watch to see if the umpire has signaled to the bat boy for more baseballs. It means he doesn't have any left to replace the balls that go into the crowd or get scuffed. From experience I know that if the batter hits a foul ball, there will be a twenty-five second pause while those new baseballs are delivered. That's when I can play a good long rally chant." Bobby is the organist for the Arizona Diamondbacks. "You often handle everything from nutrition to psychotherapy. You work out a menu plan and order the food, then you do the pre-game warm-ups, the pre-game massages, and you also talk to the players to make sure they are in a positive frame of mind for the game." Marc is the chief physiotherapist for the Canadian women's soccer team. It is a varied group whose jobs are as different as they are. But, their continued commitment to the sport they represent sets them apart from others. In the final entry, Kevin Sylvester talks about the fan. If you are a fan of a sport and you dream big, you might find your future in the stories represented here. he has even learned to enjoy it." I thought my hands were big! And then, I measured one against the actual size hand of Shaquille O'Neal. So I was feeling pretty smug knowing that my hand was dwarfed by his, until I turned the page and measured that same hand against Shawn Johnson's hand....right back to the opening statement in quick time. Mine looked like Shaq's, compared to hers. There is no wonder that Shaq can palm a ball! Shawn's hands are as compact as she is, and obviously strong and sure. If the all access tickets on the cover can't convince a young sports enthusiast to peruse this book, the opening pages, with their acetate lift-and-look insert, are sure to catch their interest. I love actual size photos...they give a true perspective and really open our eyes! On we go to learn more about the athletes, the places they work and play, and the gear they wear. These behind-the-scenes photos and the information shared will be of interest to anyone keen on sports. 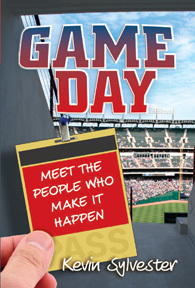 If you really want to see what it's like behind the famous Green Monster in Boston, or how the Staples Center can transform from hockey rink to basketball court in four short hours, you'll need this book. "Derek Jeter uses a black bat with his signature stamped on. Once the paint has dried, it's ready to be shipped to Yankee Stadium. An everyday player like Jeter will go through about 100 bats each season. Jeter's custom-made lumber has helped him get almost 3,000 hits in is career." Are you looking for a great gift as time winds down, and Christmas nears? Do you have a sports fan on your list? If you do, you can't go wrong by putting this wonderful book under the tree. It is sure to grab the attention as a lucky recipient pores over the photo-filled pages and shares the wealth of information provided. "Sometime later, I sat up wide-awake and clicked on my light. Daisy wasn't in bed. It was only 6:30 P.M. As I lay back on my pillows, my light suddenly went out. When it flickered on again, I was no longer in my bedroom, but sitting on a wooden chair, looking at the back of a line of gray dresses and white apron straps, edged in a hazy glow. One of the dresses turned around. It belonged to a young girl with a round face and dark skin, her black hair held back with a blue ribbon. She whispered something to the girl behind her. I could tell they didn't see me." It's been a few years since I read a Margaret Buffie novel and the wait was so worth it! I have always admired her writing. She makes a ghost story believable and engaging. In her new book, she introduces her readers to Cass and Beatrice, ancestors born one hundred and fifty years apart, but with a strong connection. In alternating chapters we come to know them well, and to learn about the lives they are leading. In fact, they are quite similar. Cass is struggling to keep her mother's memory alive in the house that she and her father are now sharing with her stepmother Jean and Jean's daughter, twelve-year-old Daisy. They are not easy times. Cass has not yet dealt with her mother's death. There is something that she knows about that day, but is keeping to herself. Everything that her mother loved is being put in storage or dismissed as unimportant, while the old house on the Red River undergoes renovations. A brooch found by Cass conjures up visions of Beatrice Alexander, whose father built Old Maples, the house where Cass now lives. 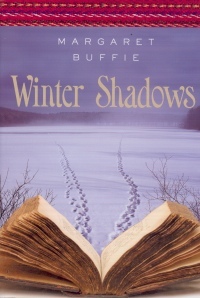 Beatrice is also dealing with an unwelcome stepmother who finds it hard to cope with 'the winter shadows of depression' and the jealousy she feels for her new husband's love of his daughter. Beatrice kept a diary that she leaves for Cass to read. In it, Beatrice talks about the difficulties she faces with her distant and domineering stepmother, and her feelings for two new men in her life. They are as different as day and night and offer a startling contrast for this lovely, young woman. Cass is struggling with living in the house that seems destined to have no reminders left of the family life she so happily shared with her mother and father, before Fiona's death. Their contact is fleeting, but the diary offers a way to keep in touch. When the real one is finally found, Beatrice has left a personal message for Cass. Her inability to come to terms with her mother's death prompts Cass to act out, and to blame everyone else for the struggles she is having. Her Aunt Blair and Cass' new boyfriend Martin help her find some peace. She is able to take this calm to a better relationship with her 'new' family, beginning to understand that Jean's life has not been easy, that Daisy is reaching out to her and that her Dad is looking for a new normal for himself, too. I love Beatrice. She is such a strong and admirable character, supporting her father through his difficult times and loving and caring for her Cree grandmother, Aggathas. She stoically accepts her stepmother's moods and mistreatment, while working as a teacher and often doing duty as the 'woman' of the house. She is reluctant to let Duncan Kilgour become an important part of her life, while also feeling an attraction to his many fine attributes. Their relationship grows slowly, with humor and warmth, and in direct contrast to the relationship she thinks she can foresee with the new reverend, Robert Dalhousie. Nohkum is a wise and lovely woman, who gives Beatrice love and support at every turn. It takes time and effort for this family to work out a place of acceptance and understanding. There is so much here to attract readers. It is historical and informative about Manitoba's past. It deals with the issues that blended families face, in the past and in the present. It helps us understand the need for communication during difficult times, and it offers up characters who will live long in our memories. What more can we ask? I can make the reader say a word! You can make the reader say a word? If the reader reads out loud." Well, it seems the two steadfast friends have some discoveries to make together. After numerous adventures in previous books, they finally observe their place in the world....they are in a book! Gerald is apprehensive when he makes the discovery that someone is looking at the two friends. Piggie, ever protective and domineering, turns a suspicious eye to the front and says he is right. Worried and fearing an attack by a monster, Gerald is reassured when Piggie announces that the someone is a READER. 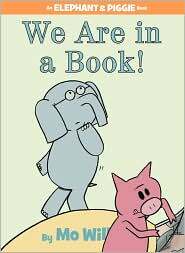 When Gerald does not quite get the meaning, Piggie explains that the speech bubbles means they are in a book. What excitement ensues! Piggie, who enjoys power, is quick to note that she can make the reader read whatever she chooses, providing the book is being read aloud. Uh-oh! If you know these loveable characters and their previous stories, you know there is fun in store for all. It is a laugh riot and will have kids rolling on the floor! After Piggie has taken her turn with a word, she suggests that Gerald might like to try his hand at it before the book ends. Dear me!!! Piggie announces that the book will end at page 57...Gerald is frantic that they are already at page 46! What can he do? How can he stop the reading train wreck? Piggie calmly shares her thoughts in whispered tones and Gerald is content. Let's hope that the ploy works. I can't wait to share this book in classrooms, and with teachers during winter workshops! I am in awe, once more, of Mo Willems' ability to give his characters such a range of feelings using simple lines, the colors gray and pink and an extremely adept funny bone. Christmas is coming...what better gift to give than one that can be opened endlessly. It is so important for all children to see themselves in the books that they read, or that are read to them. When they see others dealing with their personal issues they get the feeling that they are not alone in this world. 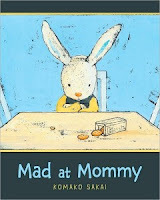 In this perfect book about a young rabbit and the anger he feels at his mother, Komako Sakai proves yet again, as she did in The Snow Day (Scholastic, 2009), that she has an honest empathy for young children and their actions. 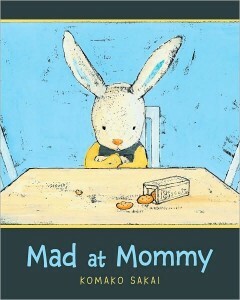 She makes the story so real and serious for the young bunny, while adding just the right touch of humor and a satisfying solution. That tantrum is a result of a variety of misdemeanors on his mother's part...scolding when he's in the tub, sleeping in on Saturday morning, hogging the TV remote, late pickups at school. The list of wrongdoings seems endless. Those downtrodden children who see their own predicament on these pages will nod their heads in wonder that others face the same fate, while parents sharing the story will quietly take note of the illustrated happenings that lie at the heart of the matter. "And you always tell me to hurry up--hurry up--hurry up--but then you never hurry up yourself," I remember the times when we would go to the mall together, in a hurry to get something done, only to be stopped by visits with friends and neighbors. He would silently wait for me to be done, and rarely say a word. But, the message was evident. It is not until the end of the list that we come face to face with what might have triggered the rant...he has just discovered that he cannot marry his mother. The anger overflows and he uses growing bigger and leaving home as his final threat. Off he stomps, out the door and gone....for one short minute. What is not conveyed in the short text is cleverly abundant in the muted illustrations. First, look very closely at the cover art...ah, the true feelings are very clear. Each new picture serves up the strength of the bond between mother and son while allowing him his say in the workings of the household. Each is a treasure, a perfect match for this fine story. but I have never seen him. Every morning, I shoot at him. Then he shoots at me. the rest of the day, waiting." In my previous post I told you about a book called The War To End All Wars (Batten, 2009) about WWI. Would that it were so! In fact, there always seems to be a war going on somewhere in the world and despite what history teaches us, we cannot seem to make them stop. Wherever those wars are happening, you can be sure that families are losing their homes, their loved ones and their trust in others. Soldiers, death, guns, heartbreak and broken promises make enemies of former friends and even family members. There is always an enemy. In this brilliant book we meet two men. Both are hiding in their holes, programmed to kill the other. That is what the manual says they must do. The enemy is dangerous and sure to be a threat to everything held dear should he take the upper hand. As they spend day after day in the same spot with no apparent action, one soldier begins to wonder about the other. Does he see the same stars? Following orders is tough work when the rain is falling and there is no end in sight to the battle they are waging. "If only he would send me a message saying, "Let's end the war now." I would agree to it right away. So what is he waiting for?" Could the answer be a message in a bottle? "Ray had been so eager to measure up to his older brothers. Just like them, he would shoot his gun and defeat the enemy. In the end, as far as anyone could tell, he never had the chance to fire his rifle. Whe he got his turn to fight the Germans, his time on the battlefield lasted no more than fifteen minutes." Two other Goodyear boys died overseas during the war. It was a terrible price for a family to pay. Once I started reading, I found it very hard to put this book down. Military history is not my favored genre; but, great storytelling is. Jack Batten is an accomplished and oft-honored writer...deservedly so. He does not back down from the ills that befell the men who served during 'one of the most tragic episodes in human history'. Despite the success and strength known in European countries in the early twentieth century, there was conflict. Germany and Russia wanted more...more respect, more military strength and they wanted it now! England was prepared to go to war to teach them a lesson. Who could have known the consequences of that decision? Jack Batten presents the bloody conflict in clear and concise language, allowing readers to meet the soldiers who fought on the Western Front, to watch Billy Bishop as he encounters the Red Baron in the air over the European battlegrounds, to have explicit knowledge of the strategy used to plan for battles at sea and to discover how civilians were able to decode German messages being sent to their ships everywhere. The battles are described in detail, and bravely fought. Every country involved suffered unbearable loss and has paid tribute to the bravery and heroism exhibited in each battle. He pays special attention to Canadians and their contributions to the war effort. The book is designed to maximize the information shared, with numerous archival photographs and captions to add interest. It follows the trajectory of the war and keeps readers moving at a quick pace throughout the reading. It is not too long, yet gives a clear picture of the men who fought the many battles described. "The corporal was wounded at the Battle of the Somme, suffered from the effects of gas in the last battles at Ypres, and was awarded an Iron Cross. He came away from the war with a lust for revenge against the enemies that had inflicted defeat on Germany. The angry corporal's name was Adolf Hitler." If you have an abiding interest in military history and the First World War in particular, you are sure to find that this comprehensive recount will satisfy your curiosity and add to your previous knowledge. Check the reverse side of the dust jacket to find the maps that will help you follow the action as you read this compelling book. a little longer to ensure that Bill could bail out. and the plane began its death spiral." The 1st Canadian Parachute Battalion landed at Normandy on June 6, 1944 and, after battling with the Germans, they returned to their base in England in early September. For anyone interested in military history, this book gives life to the invasion through the eyes of the courageous men who fought that tough battle. They had much hardship to face and were adept in their planned landings behind enemy lines and in helping to secure success for the Allied forces. From the moment they dropped behind those enemy lines, the men experienced the same feelings that other military forces were feeling. They were elated that the mission had begun, apprehensive at their lack of knowledge of the region and frightened by the ferocity of the fighting. The book brings their experiences front and centre through quotations, conversation and the seasoned research of the author. He is a noted military historian and has written numerous books on military affairs. Colonel Horn does not sugar-coat the very real consequences of war. Many of the men who jumped from those planes did not live to tell their tales, or to see their loved ones again. An epilogue adds information about the batallion upon their return to England, and their subsequent missions. They had much to be proud of as they set sail for Canada in May 1945, and were officially disbanded in September. They had earned a 'proud and remarkable reputation'. That standard of excellence challenged all who followed in their footsteps. There is an index, a list of websites, and a selected bibliography. The illustrations and photos included add to the immediacy of the story and also provide six sketches by Montreal artist Ted Zuber, himself a paratrooper. A useful and informative map of the Normandy area is included. Three types of information boxes add interest....DID YOU KNOW?, FROM THE INTELLIGENCE FILES and FROM THE WEAPON LOCKER are interspersed throughout the text and they provide practical and compelling data. We can only assume the accuracy of the account, given the legitimacy of the author and the rigor with which he tells his story. The guns are continuous now and cannot be far off. hyst the normal activity of this war." "I have decided - fool or fanatic, I am going to sign up with Iain tomorrow. What is there to stop me now? Only Anne, and she has given her permission. I cannot stay here. I will join Father's regiment and take his place." "This is a very changed war from the one that Father fought so briefly. It's hard to believe it's only just over a year since then. He marched for weeks, but we sit in trenches that have not moved for a year. The strain of our position merely induces a lethargy and unwillingness to undertake anything out of the ordinary. In addition, I find that writing reminds me of home and makes the situation here even less enjoyable." "The guard said I was found walking along a road and that I refused to state what I was doing or where my unit was. I know what I was doing - I was going to get you and your father and Aunt Sadie. We are going to Canada. But I cannot tell them that - it's our secret. I know this is difficult to read, but I cannot stop my had shaking. I also seem to cry for no reason. I don't think I have slept in a long time. I am too scared." This pain and horror of war is unmistakeable in the pages of this diary. We come to know Jim as he discovers these things for himself; first through the devastating loss of family, and then as he plods daily through the reality of the war. We feel the emotions he shares almost as personally as he does. We grieve with him as he witnesses the toll war takes, and as he must face the army's treatment of deserters in wartime. It is heartbreaking. the killing. My grandmother lives here with us. want to make us sad." I so admire Deborah Ellis for her writing, her passion for her stories and her political activism concerning peace and the rights of human beings everywhere. Her books inspire others to support those whose plight is so eloquently described there. She tells her readers about children who live in unbelievably harsh conditions and gives those children a voice and perhaps even hope for better things to come. "I believe that we can create a world without war. One of the steps we can take is to fully understand the impact of our decisions on the world's most vulnerable - our children." These vignettes are shared in the words of the children who are victims of the conflict in Iraq. Through them, we see the human toll taken as these narrartors deal with their everyday lives and the effects of the fighting there. There are so many issues that impact the children and no easy solution for those things that concern them. "People watch war in movies and they think they know what it is like. They don't know. If they knew, they wouldn't allow it to happen. Only very sick, bad people would want to make war." "I have nothing in common with American children, except if there is maybe an American child whose father has died, whose house is destroyed, and who is forced to live in a foreign country that doesn't want them. Then he and I would have something to talk about." "So we are all smart people, and should have good futures ahead of us, but so much seems to be beyond our control. My mother doesn't have an independent income, and my stepfather is unstable. We are one tantrum away from being thrown out and having nowhere to live." Is there hope? Can we learn? Understanding has to be the first step. station stood on the cliffs west of the town. Perhaps 500 commandos could knock it out?" If you know little about Dieppe, or Canadian history in fact, you need to meet Hugh Brewster. Well, through his books at the very least. I have come to know much more than I once did by reading and talking about his fine books with teachers and students. Many Canadians are not even sure in which war the raid on Dieppe occurred. This book will surely change that....it is filled with sadness as it explores the role played by Canadian soldiers overseas during WWII. It is a book written for young people, while being equally of interest to adults. I read it and that is why I am telling you about it here. Nothing has been omitted. The raid is detailed from the planning to its execution, the abject failure and the resulting consequences for those who survived. In 2007 the sixty-fifth reunion was observed and is described. The accuracy in the telling is admirable and the author has filled its pages with maps, timelines, photos, numerous quotes and informative sidebars. Once started, I could not put it down. As you might imagine, stories of war are not my usual fare. The writing is so personal and attentive to detail that I found myself wanting to know more. In the reading I became a more informed Canadian, and that is a good thing! "Of the 6,090 men who took part in the Dieppe landings, 4,384 were killed, wounded or missing - a loss of almost three-quarters of them. Of the 1,027 who were killed, 907 were Canadians. All the equipment landed on shore was lost. The Royal Navy lost 550 men and 34 boats." The time following the Dieppe raid brought more heartache for the men who were imprisoned and fought daily to maintain their spirits, their health and their unwavering belief that the war would come to an end and they would return home to their families. "The people of Dieppe have never forgotten the Canadians and their sacrifice. Every August 19, Dieppe's streets are festooned with Canadian flags, and memorial services are held on the beaches and at the Canadian War Cemetery." There is an index, a glossary, a selected bibliography, a list of websites for further learning, and a section about 'Dieppe Veterans' which highlights some of their post-service lives. If this is your introduction to historian Hugh Brewster, I trust it will lead you to look for some of his other books. These include: On Juno Beach (Scholastic, 2004), At Vimy Ridge (Schoalstic, 2008), Anastasia's Album (Little Brown, 1996), To Be a Princess (Scholastic, 2001) and The Other Mozart (Abrams, 2006). 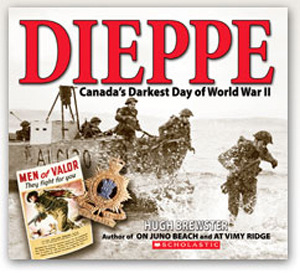 As I signed off tonight and checked my email, I found an announcement that Dieppe has been named the Honour book for Information Book of the Year by the Vancouver Children's Literature Roundtable. Congratulations to Hugh for that! I was lucky some years ago to attend a workshop given by Linda Granfield, where she spoke about research and the her process for finding intriguing subjects and amazing artifacts before starting a new book. She is an inveterate collector of 'things' and willingly shared her insatiable curiosity. In this book about the man who penned 'In Flanders Field' she uses the scrapbook format as a way of gathering and presenting the research that she did. She follows his life from birth to death, culminating with the wearing of the poppy in remembrance. Readers will find themselves coming to know this fine man throughout his life. 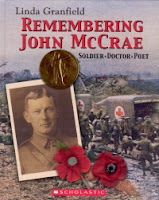 Using a balance of text and pictures, Linda Granfield gives her readers access to John McCrae, sharing clear information and captioned photos from his life. As with all good nonfiction, readers move from place to place on the page, gathering needed information as they go. Historically accurate, she offers much of interest in exploring the past. Archival photos add to the feelings of immediacy and make a personal connection with this beloved man. His letters provided rare glimpses of wartime action to those far from the front lines. The death of a close friend inspired him to take pen in hand and write his most famous poem. It was composed in twenty minutes. Despite the fact that he wrote much more, it is this one that has eclipsed all the others. I like the design, which allows her audience to move around the text, gathering much information as they go. This not Linda Granfield's first book about the man or his poem. She has written other books about war and her writing is well-known and highly respected. Her subjects are varied and hold our interest. Her bibliography is worthy of attention and her many books should find a place in homes and on library shelves. She honors her subjects with diligent research, fine writing and an abiding need to inform. For it marks a soldier's bed." my leg and climb under the covers. I don't what the enemy to see me like this. Then I jump out of bed and grab my gun." "As always in wars such as these, innocent people - especially children, families, poor people, and soldiers who were forced to fight - were the greatest victims. This story tells about one such child..."
His mother is dead, his leg is gone and his father is preparing to get married again. 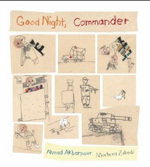 While fighting an imaginary enemy in his bedroom, it is suggested that the boy remove his prosthesis while he is home. Father says it is noisy and easily damaged. As soon as his father departs, he reattaches the leg and leads the assault against the enemy across the room, his mother watching from a picture on the wall. He acts out all of his aggression and anger in an imagined battle with those who killed his mother and caused his injury. One of his enemies is of particular interest when the boy discovers that he is young, has lost his mother and a leg. He does not have a prosthesis and wonders out loud how it helps. The young commander shows compassion when he lends it to the enemy soldier so that he might show his mother...also a picture on the wall who 'can see him'. Despite misgivings about the failure of his mission to avenge her death, his mother is reassuring and the boy goes to sleep with her blessing. The child-like pencil drawings are rendered in subdued tones, with only a few spots of color. We watch from above as the tanks, guns, soldiers and the room's furniture are lit by a single bare light bulb. There are land mines, grenades, bombs and enemy soldiers, but he shows no fear, buoyed by his mother's presence. 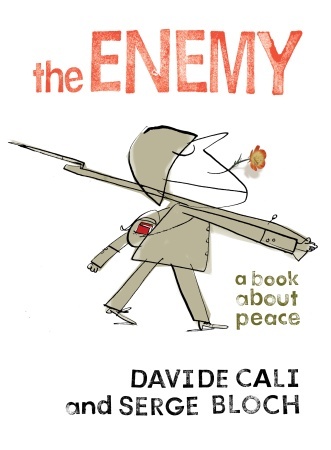 Can a child make sense of war and its devastating effects? Books such as this go a long way in helping children sort it all out. 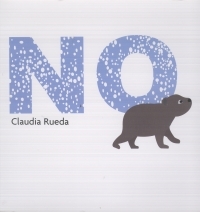 NO, written and illustrated by Claudia Rueda. ""There's no food to eat," said mother bear. "I saved some berries," said little bear. "Winter is very long," said mother bear. "I don't mind if it's long," said little bear." You don't need elaborate pictures or a plethora of words to tell a story! But, you may need experience with independent toddlers and young children to understand the subtlety of this one. They know their minds; and if you have ever been privy to a temper tantrum, you know their determination when they are trying out those wings of independence. Little bear is not unlike any 'child' his age. It's winter and his mother is trying hard to get him to hunker down and escape the harsh cold that the season brings. He doesn't want to go to sleep. It seems that no argument is strong enough to convince him otherwise. Mother bear is persistent, a trait that she has passed on to her young cub. For every reason she gives, he has an argument. Finally, she does what all mothers must do. She lets him try those wings on his own, despite the coming storm. There is a lesson to be learned here. Little bear is excited and delighted. He frolics and builds a snowman as the snow continues to fall. As the winds increase and the storm asserts its power that snowman disappears. The same happens to one small bear who has finally learned his first winter lesson. Calling his 'Mamma!!! ', he finds the way to their nearby winter den and softly allays his mother's fears of loneliness without him during the long, cold season. The story is simple, and the pictures aptly match its tone. Double-page spreads show the true wonder and force of the season. The artwork is done in grays and white, and reflect the cold environment. While the setting is necessarily severe and uncomfortable, there is warmth and solace to be had for this small bear and his mother...they find it together. This lively story helps young readers renew their belief that security can be found within the warm circle that is family, and that we all need to test the waters to find our limits. swirliest, snakiest, scariest, curliest slide. We climb to the very top. Is this story true for most kids these days? As we hustle and bustle through life, do we forget what's most important? Have we even decided what that is? Is it because I am old enough to be a grandparent, have retired from the job that I loved for many years that make me notice these things, or is it just a habit that we have all fallen into in this fast-paced, hurry-up world? Is it true we have NO time, NO choices, NO alternatives to the life we are living? Poor Sara! All she wants is time with Mom and Dad and they can't find it. It's Saturday and Mom is busy with the laundry basket, the vacuum cleaner and her computer. Dad is washing dishes, cleaning the car, and doing the weekly shopping. Sara thinks it must be up to her to catch time with a butterfly net and a jar. She tries and fails miserably, no matter how many times she tries to capture it. In desperation, she demands a STOP! It shocks her parents, but has the desired effect. In the stillness of that moment, she is able to grab some time, and it is all hers. Off they go to the park, where they share Sara's time with fun and laughter. It is perfection! It could be preachy, but I didn't find it so. It does remind us that only a few things in life are really important. And, there is always TIME! It is our most precious gift to family and friends. The lively, yet poignant, illustrations serve to remind that life is an adventure for our children. Sara's search is both joyous and frustrating. We are always aware of the way she is feeling about it by just looking at her face. All the images created to portray time will 'up' the talk as the book is shared. In this story of journeys we follow Pell as she runs away on the eve of a marriage of convenience for family and great distress for the bride. 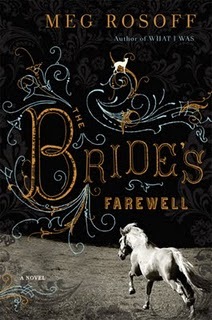 She finds she cannot follow through with the plans made to marry Birdie, the blacksmith's son. She takes her horse Jack, and the meager stash of coins that was to be her dowry and sets out, only to be be joined by her adopted brother, Bean. He is mute, and has a special place in her heart. He is observant and seems to understand much about Pell that she might not even know about herself. She cannot leave him. They journey together to the fair at Salisbury in hopes of finding employment at the horse market. Pell has an affinity for horses that is quite admirable, and mysterious. for a time. Duped by a horse trader, Pell returns to the spot where she left Bean and Jack to wait for her, only to find them gone. In alternating views, we watch Bean in the wretched conditions that become his life, and Pell as she searches in vain for her brother and the life she thinks she wants. Along the way she is accompanied by a gypsy dog, Dicken. He is a character in his own right, and brings some peace to the abject misery that befalls Pell. The characters are a wonder, the writing is so elegant and lovely, while telling a heartbreaking and bleak story. As she seeks her place in the world, she meets people who can and cannot be trusted. When she returns home she finds that things are worse than when she left and that there is nothing for her there. Through it all, there is hope that Pell might find some peace for the future. Meg Rosoff tells powerful stories and I look forward to every one of them. that lace fan will be mine." I am sure that many avid readers of children's literature harbor a niggling worry that a sequel might not live up to the delight found in the first book. 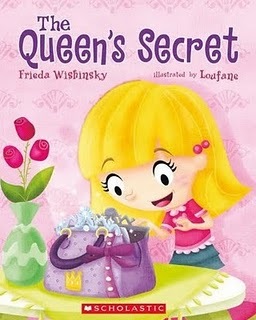 As each new Fancy Nancy book is published, I must admit to a little blip of anxiety before reading it. I do NOT know why...for, each time Jane O'Connor adds to her growing list of stories about this independent and confident 'girly-girl', I am impressed. In this story of sisters, Nancy brings all of her joy in life to the preparations for JoJo's upcoming birthday. They are off to the party store to buy everything pirate...JoJo's obsession at the moment. Quietly and without JoJo's noticing her, Nancy buys the perfect gift...an elegant eye patch and uses most of her saved money for the purchase. As they wander home they make a quick stop at 'Belle's Fabulous Fashion Boutique' to check out the fancy lace fans in stock. One is on the bargain table! Her money spent, Nancy must dream up another way to make enough money for a return trip to her favorite store. That she does! Soon, her own fabulous fashion boutique is up and running. Nancy harbors the hope that she will make enough money to buy the fan she so covets. Customers arrive and sales are brisk in the beginning. They soon drop off. A glitch in items sold leads to an important decision and drives the rest of the story toward a most satisfying conclusion. Lacking any form of artistic talent, I cannot imagine the fun that Robin Preiss Glasser has in creating the artwork for these books. She fills the pages with such whimsy, and expression. Every image is rife with details that delight and fire the imagination. They elegantly match the text, while adding little touches that do not go unnoticed. It is family and friends that work together to build the boutique, encourage sales, and keep it running. It is Mom who comforts JoJo when she is having a temper tantrum. It is Robin who creates these fun-filled pages for fans to pore over each time the book is shared. Bravo!